The one-piece Delta Skymirror pool has arrived at Certikin to great acclaim and ready to capitalise on the 2011 pool season ahead. 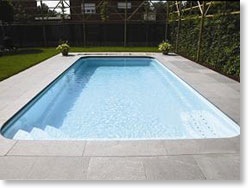 The constant depth pool is made from premium quality vinylester resins ensuring the highest standards of manufacture. This incorporates a revolutionary honey-comb structure which dramatically reduces the osmosis effect. The pools are oven treated during the manufacturing process to ensure a complete polymerisation. Thanks to the durability of this material, each Skymirror pool comes with a 15 year warranty on the pool structure. Attention has been paid to every detail and the design is second to none with even an underwater long chair added for extra relaxation. The pool comes with a skimmer, underwater light transformer and deck box, two returns, two low level suctions, one vac point and one auto top up. Two sizes are available 7.5m x3.4m x1.5m and a larger 9.5m x 3.8m x1.5m. For more information visit www.certikin.co.uk or call 01993 778855.